The new Lamborghini EGO is a concentrated package of energy and design, a compact and nimble tractor with the attitude of a tractor in a higher power class. It offers multi-role versatility, with generous standard equipment and a complete range of accessories catering for a wide variety of applications, while its compact dimensions make it the perfect tractor for working in restricted spaces. 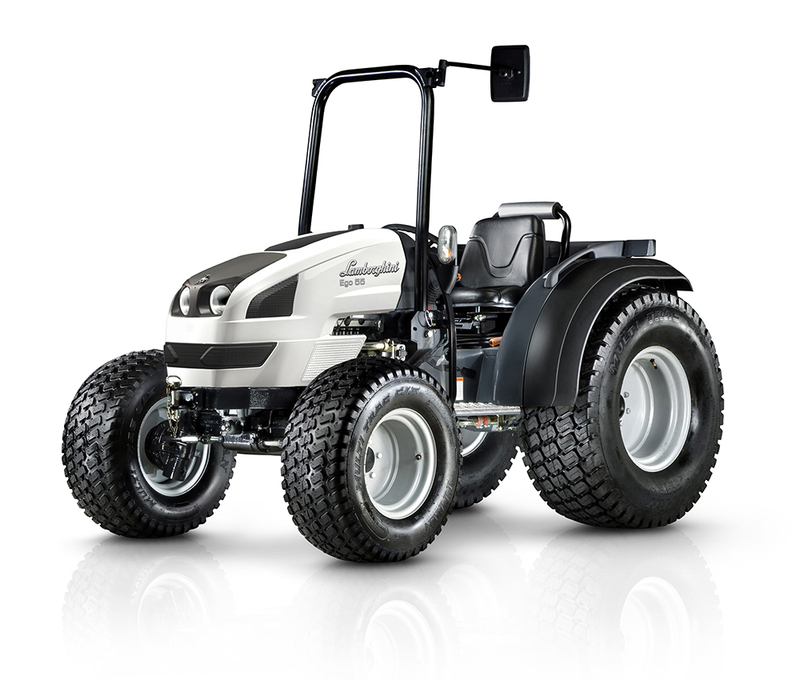 The design of the Lamborghini EGO combines structural simplicity with the exclusive new white livery - features which make this new Lamborghini tractor a unique machine unlike anything else in its class. The Mitsubishi Tier3 four cylinder, indirect injection, liquid cooled engine is offered as a naturally aspirated version or a turbo variant with an outstanding torque curve giving the flexibility needed to cope with sudden variations in load. The fuel tank is situated between the instrument panel and the engine, for maximised cooling system efficiency, while a 15 litre supplementary fuel tank is also available for extendedperiods of work. Contributing significantly to the outstanding agility of this tractor is its transmission, offered with a synchronised gearbox and reverse shuttle, providing 16 x 16 FWD/REV speeds with supercreeper. A generous steering angle of 57 degrees and a rapid steering action make manoeuvring quick and effortless. Outstanding safety is ensured by button-operated front and rear electrohydraulic differential locks and wet disc brakes. To cater for a variety of applications needing different implements, three PTO configurations (rear, front and mid) are available to ensure the right connection solution and speed for every job (rear speeds available: 540, 540/540E or 540/1000 and ground speed). For unparalleled efficiency, the new Lamborghini EGO has two separate hydraulic circuits: one with a dedicated 33 litre/min pump for the 1,200 Kg rear hitch and the six-way distributors, and another with a 17 litre/min pump for the hydrostatic steering system (for an impressive total hydraulic capacity of 50 l/min). An optional 400 Kg capacity front hitch is also available, with folding coupling bars and independent 1,000 rpm PTO with electrohydraulic clutch. The EGO is available as cab or platform versions. The cab is as compact as possible to maximise the agility of the machine, but without sacrificing comfort. The intuitively laid out controls also contribute to the tractor's superb comfort and ergonomics.